When an idea to paddle 227km between the Spanish mainland region of Malaga to North Africa was recently conceived, the first thing which came to mind was of course, which board to use? Departing from Malaga the journey would pass by Alboran Island and then on to Melilla, a small North African Spanish-administered autonomous City, bordering Morocco. Adventurer and stand up paddler, Carlos Toro, Juan Torrecillas of the Caixa Banking Group together with Carlos Rumbaco, decided to take on this aquatic challenge, with the purpose of raising funds and awareness of the efforts made by the Spanish Red Cross, who are compelled to assist refugees who often suffer injury or sickness in crossing from mainland Africa to Europe. Initially it was simply the challenge to do so, but the idea to make it also a fund raising event, ensured TV exposure and the chance for added sponsorship. 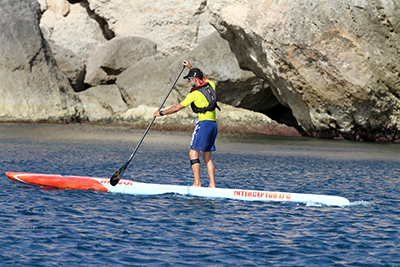 Juan Carlos Garcia Guerra of Navigaport and Mistral Spain, was to be on hand to support the team of three, providing logistical support by use of his charter Catamaran and supply of Mistral equipment, in this case, the sublime Interceptor 17’6” – the ideal board for the task in hand. Regrettably, Juan was ultimately unable to attend, but was to be with them in spirit, though his support by use of equipment was still on hand. 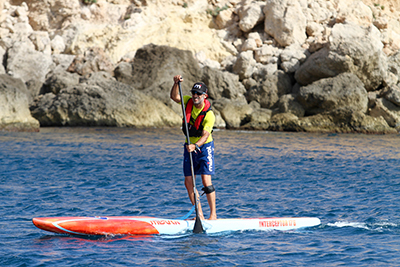 The decision to do so on a stand up paddle board (SUP) was not necessarily the most logical one, being as sea kayaks or similar would make provision for a physically easier challenge. However to do so by SUP, focused on the challenge more acutely, which made it ever more important that the choice of board was fit for purpose. As with all of Mistral designs, we think long and hard before committing to the shaping process. This involves being very clear on the objectives we are setting out to achieve so as to combine and use all of the differing design elements to bring about the desired result. Neither are we wasteful in making endless prototypes, which is more of a recipe for confusion than clarity. The motivation to design and develop two differing unlimited boards targeted for full release in 2019, was simply based upon the belief of the pursuit of the zenith, the peak of development the sport inspires. Such boards are not constrained by restrictions of convention and are unquestionably the fastest of the board designs available. By means of a simple mathematical formula, added water line length and sleekness results in longer glide times and often added stability for a narrow hull shape. Add to this the ability to add a foot operated rudder system and you are on your way to adding in a level of functionality and versatility which elevates the very experience of the sport, to another level. It made sense to create two differing boards simultaneously in order to have comparative and directly opposite boards in respect of the conditions for which they are intended; the Stealth 17’6” for flatter waters and the Interceptor 17’6” for choppier conditions. Conceived by Steve West and co-designed with Chris Diplock, the team took the very best of what had been created beforehand in 14’ versions of the Vortex and Equinox boards. The resulting Stealth flat water board, is devastatingly sleek and as fast as she looks. A super low drag co-efficient, makes this board, very fast to accelerate and it glides with effortless effort, during the recovery phase of the stroke. The Interceptor it was decided, should not be a dedicated downwind board, but be designed so as to be able to perform in a variety of water conditions, including down winding when conditions permit. With this in mind, this was the logical board for the 227km challenge which lay ahead. 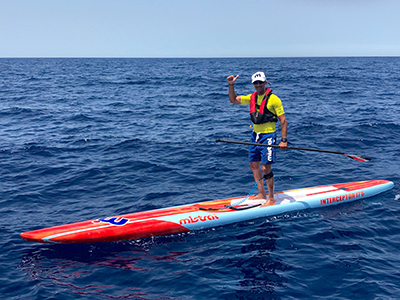 Supported by Caixa Bank, Navigaport, Mistral, Red Cross Spain and Toro SUP, the conditions for crossing proved to be hot, with light winds and a slight sea, with some choppy sections and took just on three and a half days. Paddling during the day from just after sunrise to sunset, with one paddler resting on board the Catamaran, one leading, the three paddlers fell in love with the Interceptor, expressing that it was like no other board they had paddled before, making the experience achievable and pleasurable in attaining their goal. Creating boards with no boundaries, very much represents the spirt of Mistral, to be provide vehicles of desire and aspiration which can provide free-thinking adventurists and pioneers, with the best of the best equipment capable of delivering truly amazing levels of performance. Further afield in the USA, our Interceptor 17’6” is receiving great accolades from paddlers who are using the board for long distance paddling inland on the Colorado River for example. “A Magic Carpet Ride”, has been the term used to describe the sensation of being on the Interceptor and indeed the Stealth too, described as “Like nothing else I’ve have ever paddled” which tells us we have achieved our aims in creating boards which help to raise the paddlers experience of the sport and take it to new levels of enjoyment. More on this another time.